The Derry City team which won the Irish Cup in 1964 with victory over Glentoran at Windsor Park. DERRY CITY Football Club will host a ‘Past, Present and Future’ event at University Ulster’s Magee campus this Friday night to celebrate and embrace the rich history and heritage of the Brandywell club. This year marks the 90th anniversary of the Lone Moor Road club’s first competitive match and it’s also 30 years since one of the greatest teams in League of Ireland history, managed by Jim McLaughlin, completed the historic ‘treble’ - an achievement which has yet to be equalled! 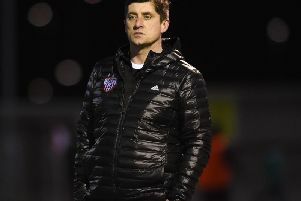 The function will be attended by Derry City manager, Declan Devine, players who have represented the Candy Stripes during its Irish League days, members of the treble winning team of 1989 and some of its current squad in an attempt to encapsulate the unique history of the club and share experiences. Derry City prides itself on being a community club and while the event was originally open to just season ticket holders and supporters’ groups, the club has now extended the invitation to anyone interested, although there are limited tickets available. The club’s Media and Public Relations Officer, Mr Lawrence Moore insisted the event is more than just an evening of nostalgia and celebrating the past as the club intend to use it as a platform to reach out to the public. “It’s a celebration of 90 years of history and a big factor in that is celebrating 30 years of our treble winning team as well which we haven’t been good at celebrating if truth be told,” he explained. “We’ve had one of the best teams in Irish football, if not the best team Irish football has ever seen and we need to be celebrating that. “What we’re trying to encapsulate is the history of the club,” he continued. “Derry City is a massive club. We’re probably only getting our heads around that ourselves about how big the club actually is, even outside Ireland. “It’s very unique and we’re celebrating all of that. We’ll also look to the future and that’s why we have the young Derry City teams, young boys and girls, involved in this as well. The Derry City team ahead of the club's first ever competitive game in 1929. The club also plans to dedicate each home game this season to a ‘2019 Wall of Fame’ winner where one person or player who has contributed to the club’s success will be honoured. And the first of these presentations will be made on Friday night. So what can we expect from the night? “It will be very informal,” added Mr Moore. “There will be a ‘meet and greet’ and a chance for supporters to mingle with players. Derry City manager, Declan Devine and his backroom team of Paddy McCourt, Kevin Deery and Martin McCann. “This will be followed by a video and Q&A in the lecture theatre at 7.45 p.m. where Tony O’Doherty, Liam Coyle, Paddy McCourt and Declan Devine will be among those taking questions. The evening begins at 7p.m. and tickets are limited, therefore anyone interested in attending is strongly advised to contact the club at emma@derrycityfc.net as soon as possible.